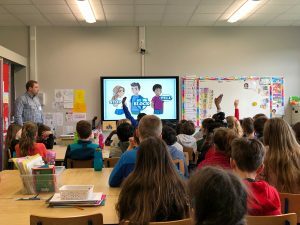 Zeeko Internet Safety Talk – Midleton Educate Together N.S. We recently received an Internet safety talk from Zeeko. Both 4th classes joined together to listen and hear about internet safety and well-being. If someone asks for information about you online, you should: STOP. BLOCK. TELL. This means stop what you’re doing, block the person who is looking for information and tell your trusted adult or Chat Buddy. Don’t share or post a picture online that might embarrass someone else OR embarrass you later on – we use the ‘T-Shirt’ rule, which means only post pictures and comments that you would happily wear on a t-shirt. Do not share where you live online – STOP. BLOCK. TELL. We also learned about the 5 to 1 rule. This means, you should do 5 hours of real-life things – reading, going to school, go for a walk, talk to your family, this equals 1 hour online or using technology. James from Zeeko reminded us of the importance of not spending too much time online or using technology. 4th class are all trying to do more active things first before earning our one hour online! We are also ‘switching off’ one hour before bedtime. We hope you learned a few tips from our blog. 4th Class Laura and John.